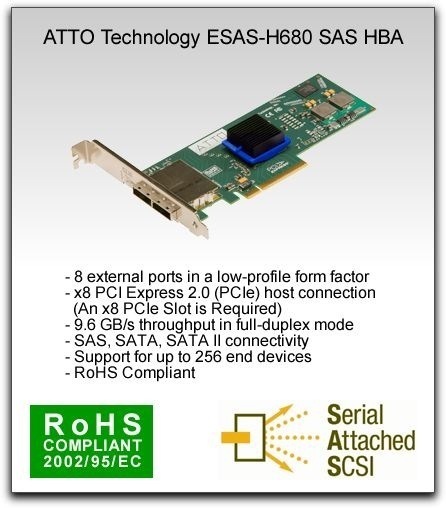 As mentioned, the LTO drive is a Hewlett Packard unit inside of a external case, and has a single SAS connector. The case is nothing special, and if anything is a bit on the ugly side. In this case, form did not follow function, it just never showed up to the party. It’s not a big deal given that the unit will be located out of sight in most instances, but it’s still worth noting. But there is one thing I really dislike about the case. It is noisy. I don’t have any sound measuring equipment, but being the nerd that I am I can tell you this unit is LOUD when it’s on. Too loud if you ask me. And I’m not talking about when the tape is shuttling all over the place (it’s even louder then), I’m saying just when you flip on the power button. I don’t think any attempt was made what so ever to make this thing quite, and it is far too loud to have in a edit suite while you’re working. Even if you’re not doing sound editing, it will drive you insane after awhile. We DO have it in a edit suite, but only run the backups after hours because of the noise it creates. When I return in the morning and open the edit suite door, it sounds like I’m entering a machine room that’s full of all kinds of hardware fans. I asked Tollis about this, and they said they didn’t consider this to be a noisy unit. I disagree, especially when you’re selling it as a “Edit Bay” product.There’s nothing physically wrong with the unit, it’s not as if a fan is broken, so it’s just the way it was designed. We plan to relocate ours into a machine room soon with all of the other noisy gear. It’s important to note that all of our backups are done over gigabit ethernet. What that means is that we can keep the LTO-5 software and hardware on a central machine, but still access every machine in the office to do backups. In our case, we only have 2 places that the editing projects and media are stored, but neither of those are on the local machine running BRU PE. 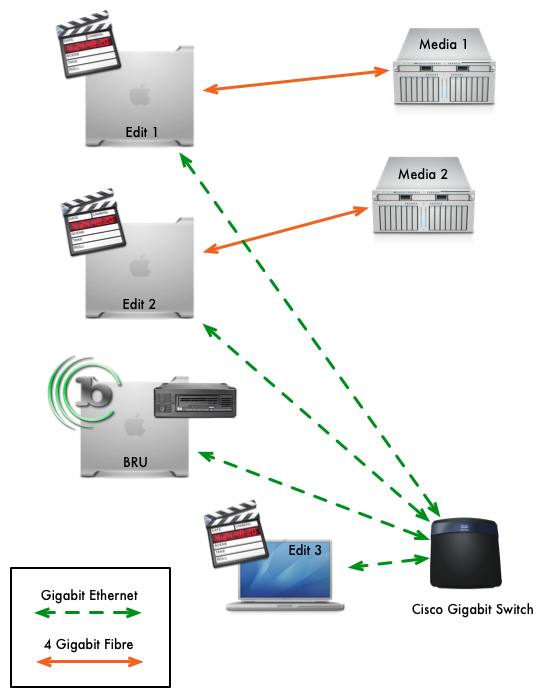 As shown in the diagram, we have multiple machines accessing 2 main media drives, and a G5 that we use exclusively for BRU PE. Having used a few different backup programs over the years, I can tell you that backup software (regardless of backup media type) falls into two categories. There is the really full featured software that was well thought out and does virtually everything you need, but is somewhat complicated to learn and use. And in the other camp you have the software that’s very easy and intuitive to use, but falls short of doing anything beyond the most basic tasks and usually lacks some critical features. I think this is the first time I’ve used a piece of backup software that straddle both camps nicely. If there’s one thing that hits you when you first start using BRU PE, it’s that it’s so simple it’s almost disturbingly easy to use. I kept thinking I must be missing something, or maybe I was doing something wrong and just didn’t know it yet. But that was not the case. 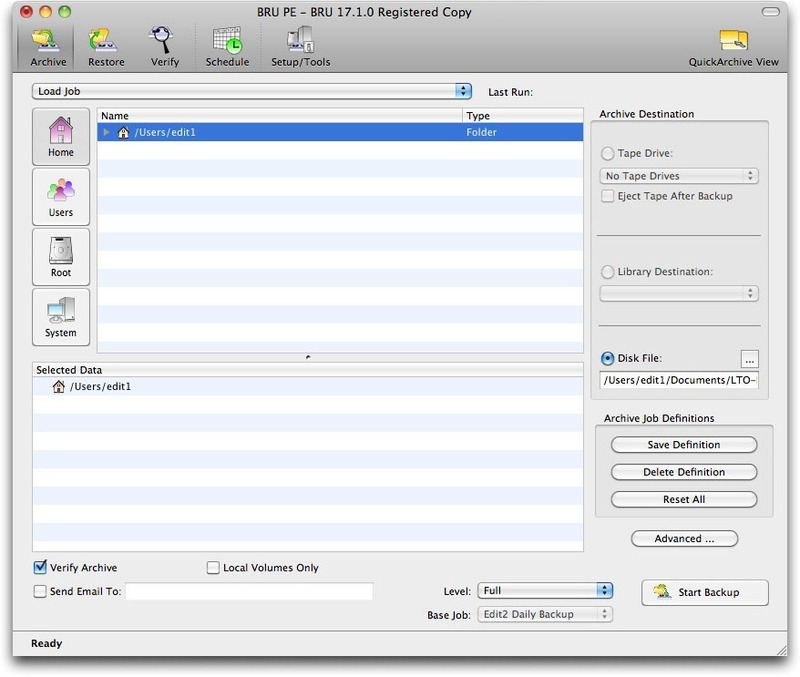 Here are the general steps to creating a backup in its most basic form. Click on the “Create Archive” button. Go have lunch and see a movie. Seriously, it’s THAT EASY. That’s not to say that there are not more options that you could choose, but you don’t have to if you don’t want to. This in itself is proof that just as their promotional information points out, you can train the most junior level of your staff to do this in just a few seconds. Even after using the Cache~a product (the Prime Cache) for nearly 2 years, I never felt like I had a good handle on how it worked or even what a good workflow was. Who knew that well thought out, well designed and properly executed software could be both powerful and easy to use!? If you do nothing more than click on the “create archive” button, here is what will happen. First, the software will scan the files that you dragged to the window and display a estimated size of the final archive. This is handy to make sure your final archive is not larger than the media you are putting it on (although you can span tapes, so that in itself is not a big deal). If you do nothing, this dialog will go away after 30 seconds and it will start the archiving process. Obviously, how long it takes has everything to do with the amount of data you’re backing up, but generally speaking it’s very fast. There is a very nice, good looking progress window that provides all kind of useful information. 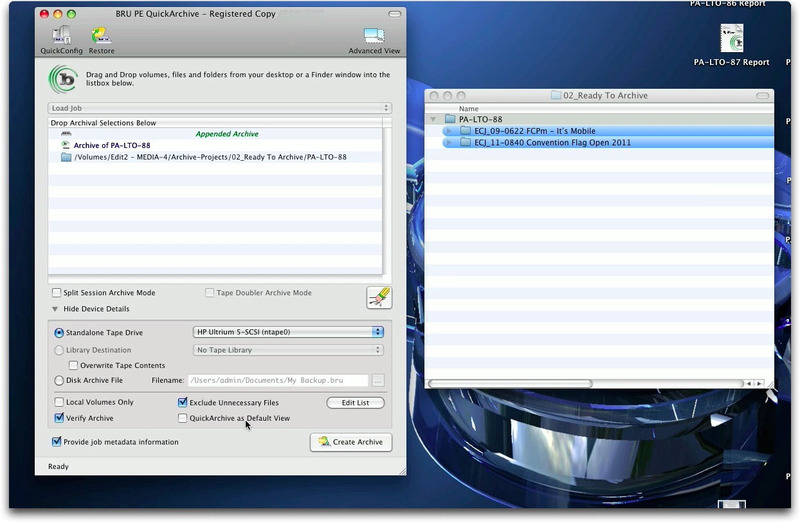 Once the archive has been created, the software will then automatically verify the archive. This is the process of comparing the data on the hard drive to the data on the tape and making sure everything matches perfectly. What’s interesting is that this is done a a 2k level, checking and comparing at 2k intervals. While this adds a bit more to the final archive size, what you get in trade is a much more robust ability to catch errors during the backup and recover from them later should you have any on the tape. After the verify is done, a summary is displayed with several reporting options. In addition to doing full backups, BRU PE also handles both differential and incremental backups, giving you flexibility on how you want to handle your archives. This comes in most handy if you’re doing regular scheduled backups of full systems and don’t want to backup everything all the time. That’s the very simple overview of how it works. In a later section I’ll go into more detail of how we use the unit and what our post-production work flow is. It’s probably a good idea to compare the BRU archive format to what many would consider the long standard of tape backup, TAR. 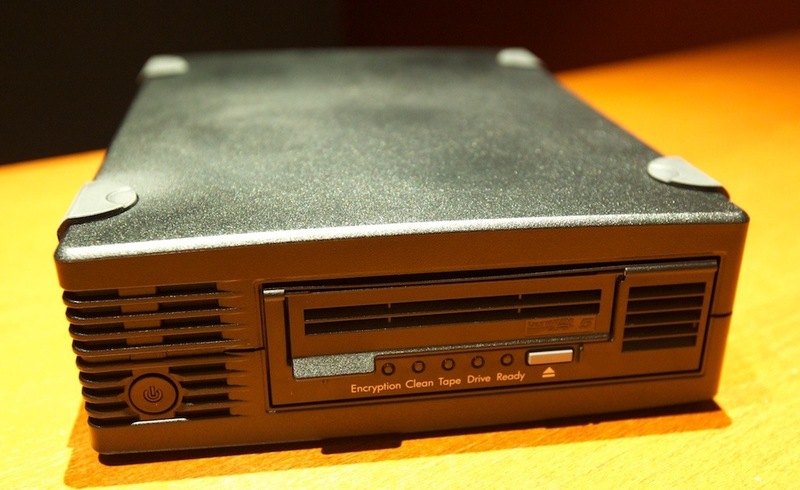 The majority of tape backup systems are based on the long standing TAR format. TAR has been around for many years and is a cross platform standard for tape backups. I’m generally in favor of open standards vs closed standards (but don’t try to take any of my iOS devices from me!). There is comfort in knowing a technology does not reside with a single company. But that’s not the whole picture to consider, or even the most important when it comes to creating backups. As The Tolis Group tells the story, the BRU format was created because of the shortcomings of the very old unix based TAR format (TApe Archive). While the TAR format has been around for many years and is widely used and accepted, that doesn’t come without flaws. Just a few of the shortcomings include lack of Checksum-based Verification, Recognition of Media Errors During Backup and the ability to recover from corrupted media. The BRU format was designed to fill in the gaps of TAR and to provide new modern features that make backups more robust and reliable. 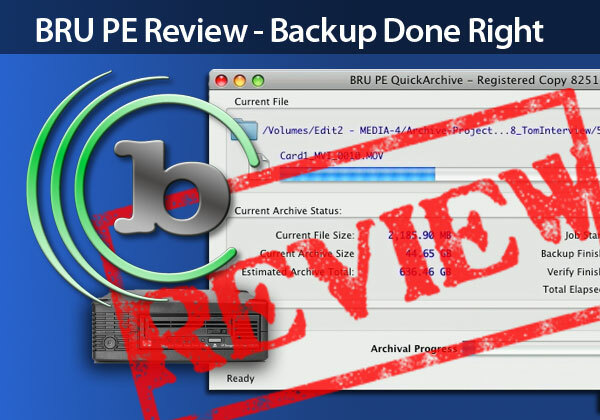 While this review is of the Mac version of BRU PE, the fact is that if you create a backup tape on a Mac system, you can later restore it on any other supported system, using any other version of the BRU software. For example, you can take your OSX created archive and with the proper software and the catalog file, restore it using BRU Server for Windows or BRU Workstation on Oracle/Sun Solaris. 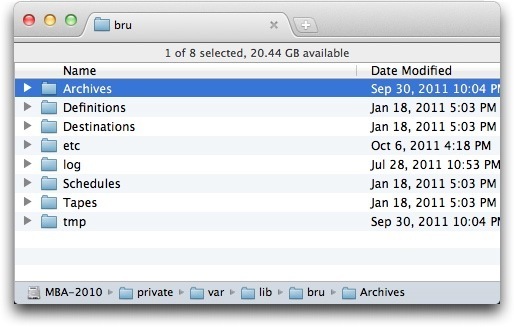 One thing that BRU handles very well, is metadata on your files. Unlike so many other backup systems we’ve tried (especially the Cache~a device) all of the important metadata is included as part of your backup and restore process. For example, file attributes such as ownership, permissions, creation and modification dates are all retained through the backup and restore process. Even hard and symbolic links are reproduced with all of their attributes intact. If you’re interested in knowing more, BRU has a great white paper on their website that explains the significant differences. One of the most important parts of any backup plan is having a good workflow. You need a way to communicate when a project is done, when it’s prepped and ready to be archived, when the archive is complete and verified and when it’s OK to delete the media and free up drive space. It’s also a good idea to keep track of what’s on each tape as well with a cataloging system. After many revisions and improvements to our workflow, we finally have what I would consider a solid plan in place. That’s what I will describe here. While the details I describe here are very specific to our setup, you should easily be able to adapt it to your operation, even if you’re not using BRU or a LTO backup system. A good foundation starts in the finder. Our projects are either ACTIVE projects, or COMPLETED projects. By default, if a project is not complete it keeps the ACTIVE project status until it is complete. This can be anywhere from a few months to over a year in some cases (although that’s rare). At Edit Creations we have 3 main edit suites, and they share two different Fibre RAID systems. We have what I have always called a semi-poor mans shared drive system. The two MacPros we have are attached directly to their own dedicated RAID systems over 4-gig fiber. But those dedicated drives are shared over Gigabit Ethernet with each other, and a MacBook Pro laptop edit system. Overall, it works out great. It allows us to open and edit with any project, in any of the 3 rooms, and have access to everything – even the render files. The MacBook Pro has no projects stored locally, and instead uses both of the RAID drives from the two MacPro Systems. This works out great because we can use a small SSD drive in the Laptop to speed it up while using the RAID drives for all of the heavy storage. 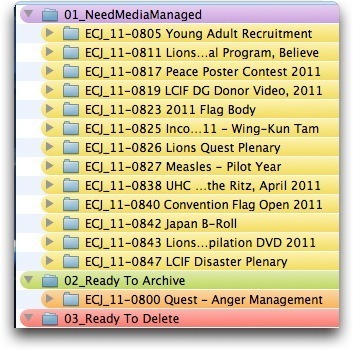 On each of the RAID drives, we have a series of folders. Active projects are stored in a single folder, and are organized by job number. We follow a rigid folder structure that’s the same starting point for every job. If a project is complete, it’s moved to the “Project Archive” on the same RAID drive that it’s currently located. There are 3 different phases of a project that is considered complete. Here’s how each of those stages are handled. About once a month I look over all of the projects listed in the “Active Projects” folder, and I have each editor do the same thing. While multiple editors may work on the same project, there’s almost always one person that’s considered the lead editor on a job and is ultimately responsible for the job. As the projects are reviewed, projects that are considered complete are highlighted in the finder using the YELLOW label. 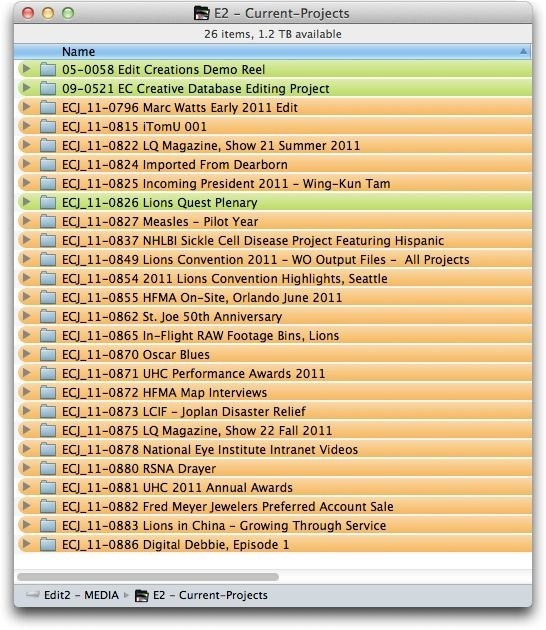 Once done reviewing the active projects folder, all of the projects marked in YELLOW are moved to the stage 1 folder of the project archive folder – Needs Media Managing. Each of the projects located in this folder now need the final sequences in the edit folder media managed so that all of the media used in the final edited sequences is included inside of the project folder. The main goal at this point is to create an archived project that can be opened at a later date and edited if needed. 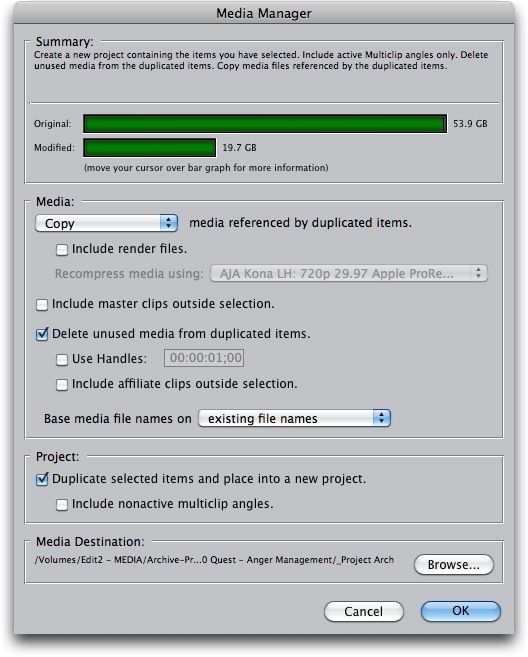 All of this media needs to be consolidated into the project folder, not the capture scratch folder. 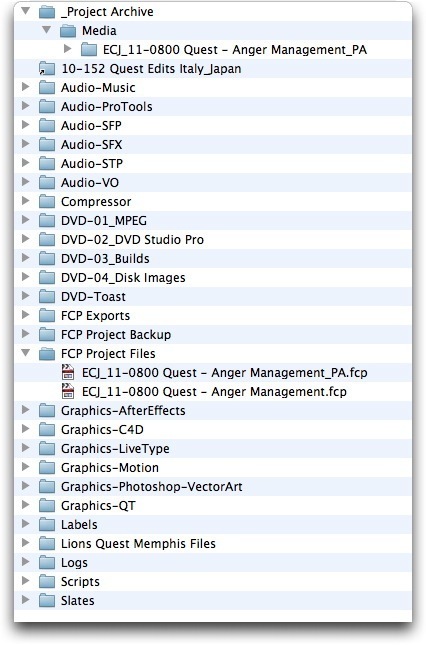 Again, since we use a template driven work flow, there is always a bin in every FCP project called “Edit”. During the process of archiving, everything inside of the edit bin is media managed and consolidated into the project folder, so that everything needed to open that job is in a single location. In the example shown here, there were several sequences for this single project (I shutter to think how I would have to handle this in FCPx). There were many versions of this final video for different regions, and in different languages. I want to have each and every final sequence in a form that allows me to easily make revisions should I need to in the future. With the “Edit” bin selected, I select Media Manager and am presented with a window of options that help me decide how I want to handle the media for these sequences. Because I don’t want to save absolutely everything, I need to optimize the settings here. I choose to COPY the media from these sequences, but also choose to discard any media that was not used in the final sequences. This alone saves a ton of space on most projects. While you can add handles that will give you some wiggle room on each shot, I almost always choose not to do this. I rarely need it, and over time it’s just wasted space on the backup tape unless you really need it. 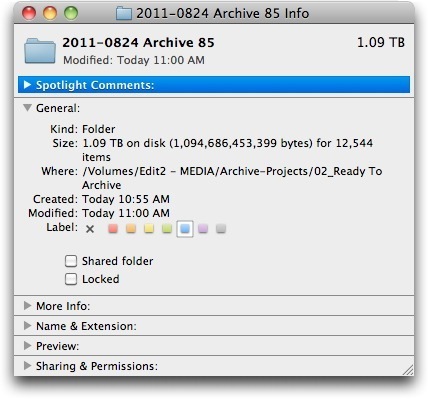 The location of the archived media is set to the “Project Archive” folder inside of the current project folder, and the new FCP project file that it creates is saved in the FCP Project folder with the exact same name, but with “PA” appended to the end (we always use “PA” to represent Project Archive”. Once this process is complete, the folder is then turned orange in the finder and moved into the second folder labeled “Ready to Archive”. 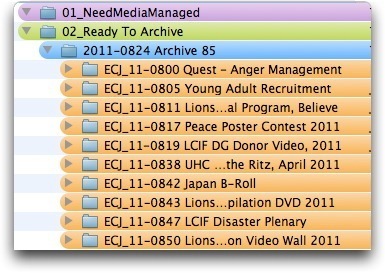 Once enough projects are moved to the “Ready To Archive” folder, they are organized into subfolders. Each of the subfolders is named with the name of the LTO tape it will be going on, and projects are added and subtracted until the folder size is around 1.2 TB. This is the approximate size that we know will fill a LTO-5 tape, but still leave a bit or breathing space. While we could avoid the subfolder process and do all of the organization inside of the BRU PE software, we have found over time that it’s just more flexible to work it all out in advance, and then just copy that single “pre weighed” folder to the LTO tape. With the folder organized and the proper size, we’re ready to archive it. Creating an archive is so simple, you have to wonder how other companies like Cache~a have missed the mark by so much. At its most basic, it’s a drag and drop function. At its most complex, you have some additional options and navigation, but it’s still stupid simple. 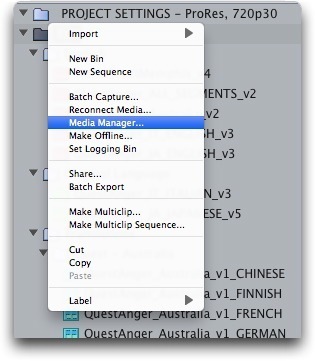 Let’s take a look at the easy option first – what BRU calls QuickArchive View. When you first launch BRU PE you are asked for an administrator password for that machine. This is not for security purposes or access control, but instead to allow BRU PE to properly restore files with the correct permissions/metadata, and to the location of your choosing. As the notice on the screen says, you can still operate the software without it, but you may have read/write issues later. Once open, you’re presented with a very simple mac like interface. In fact, the only way to get files loaded into the window is by doing a drag and drop. As mentioned earlier, we pre-prep our folders with the jobs we need to archive, and make sure that folder will fit onto the tape that we have. This is especially helpful if we’re trying to top off a tape. Please note that this review was written on and off over several months, so as a result some of the continuing action screen shots will not match up. For example, the folder we prepared was for Archive 85, but the one I’m showing in this example is Archive 88. As you can see, there are only a few checkboxes, and most are self explanatory. At this point it’s as simple as dragging our folder onto the file window and releasing the mouse. While it has defaulted to “Append Archive”, which will continue to add to a previous archive tape that still has room on it, in this case I’m going to be using a new tape, so it will actually end up being a overwrite. If you had the “provide job metadata information” box checked, this screen will appear allowing you to add other details about the archive. In general, we don’t actually use this feature since we have a very rich index of everything we archive though CDFinder (covered shortly). One nice feature that I like is the preview mode. Before it starts writing to a tape, it gives you an estimate as to how much space you will need on the tape. This will help you catch problems prior to spending hours of backup time, only to find out you were 500 megs short of space on the tape. If you don’t respond to the estimate, it will continue with the archive after 30 seconds automatically. Now that the archive is running, you’re presented with a very satisfying information screen that shows the progress, what file it’s currently working on and a time estimate. I say satisfying because watching how fast some of the files are getting backed up gives me a nice warm feeling inside. Once the operation is complete, you’re presented with the final screen that gives you a few different options. This is one of the best features of the software. First, you can create what BRU PE calls a “BRUsetta Stone CD”, that contains the tape catalog, metadata and a copy of the BRU PE software. This is great if you need to restore that tape using another machine, because it includes everything you will need to get the job done. The second option is to export the catalog file for backup, or to move the tape to another system for restore (assuming that other system already has the software installed). The third option (the one that we use) is to print the details of the job, including every file that was backed up, error messages (if any) and backup and verification information. We don’t print it out to paper, we just print to a PDF and keep it stored on the server for reference should we ever need it. A typical backup job for us creates a report that’s often over 100 pages long, so if you really do send it to a printer, make sure to have a few extra reams of paper standing by. 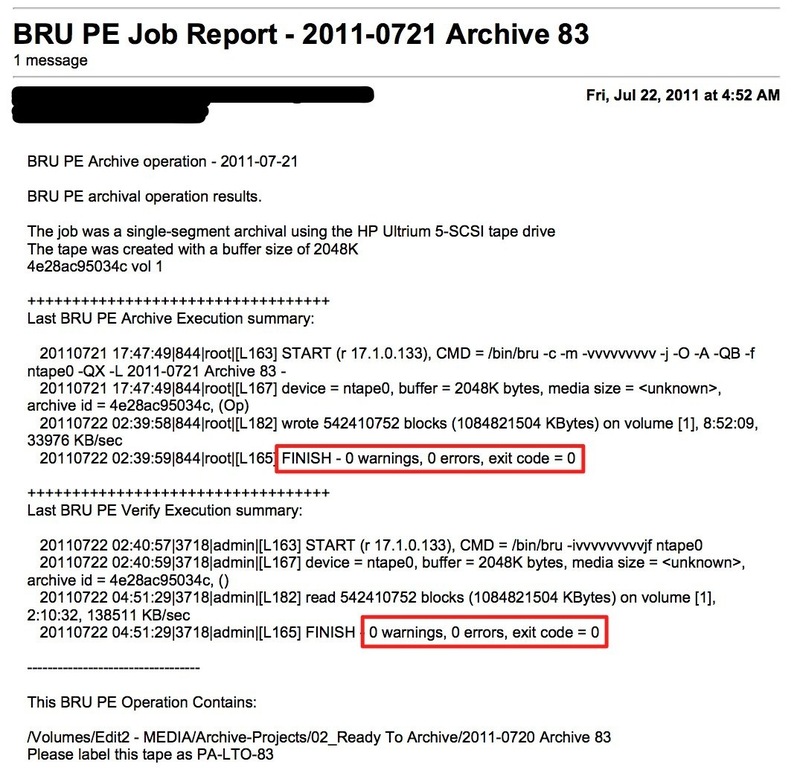 The one thing that we always verify in the report is that there were no errors during backup or verification. As long as both of those numbers are “0”, the backup is considered solid and we pop the tape and add it to the shelf. We also setup the BRU PE software to send a email to all the editors on staff when it’s complete, because that too includes a more boiled down summary of the job, and if it was completed successfully. For most people, the QuickArchive View is going to get the job done. What I really like about it is that it’s hard to get confused over something so simple. But if you are feeling like you don’t want the dumbed down interface, take a look at the advanced view. At anytime, you can switch between them just by clicking the icon in the upper right corner. 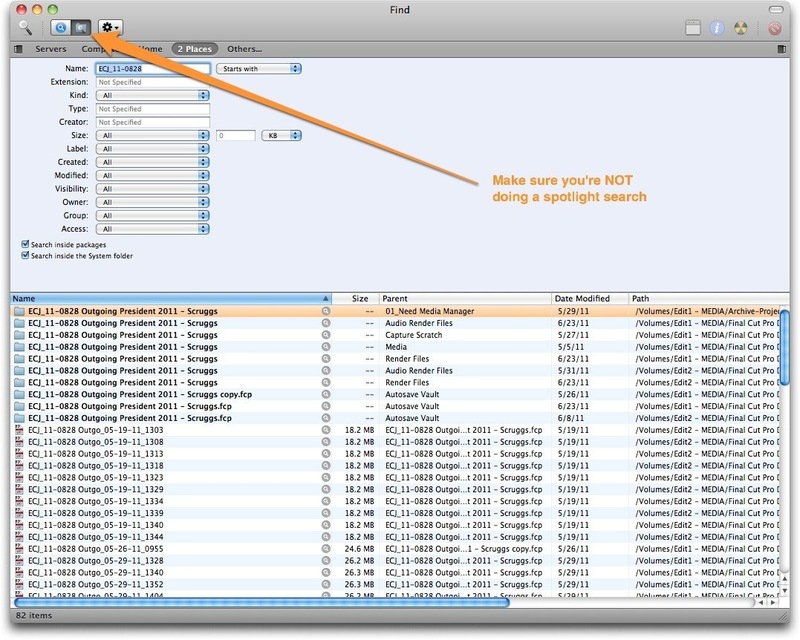 In the advanced view, the 2 main options that are added are the ability to navigate to specific areas using the shortcut icons, and the ability to schedule regular backups using the scheduling function. 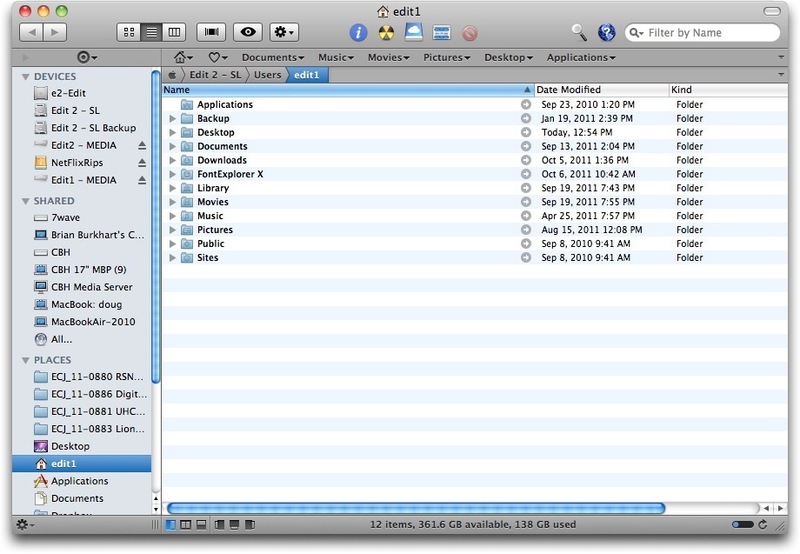 You can drag and drop files in this mode, but you can also navigate around the hard drive and add files and folders by double clicking on them. This brings me to one of my complaints about the software. 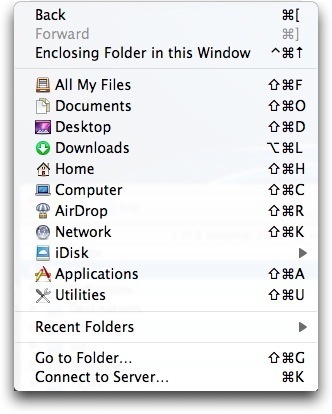 When you’re navigating around the file system on OSX, in the finder or in most programs, double clicking on a folder is how you open it to expose its contents. Not so when using BRU. To get the same result inside of BRU PE you’re forced to click on the little disclosure triangle for the directory, which will open it up to expose the contents (which also works in the finder). However, if you by instinct double click on a folder to open it, it will not actually open it but instead add it to the list of items to be archived. This is extremely counter intuitive, and hard to overcome even once you know it because it’s so second nature to use this action when opening folders. It certainly flies in the face of the Apple Interface Guidelines. If you’re not careful, you can easily end up adding additional files and directories that you had no intention of backing up. This really surprises me given how mac-like the software is otherwise. This is probably one of the reasons that I prefer the QuickArchive View. Operation otherwise is the same. You can get into saving job definitions, which is like a backup set but I’m not going to cover that since it’s not applicable to the type of archives we’re talking about here. While this review covers the single drive setup that’s best for the edit bay, it’s worth noting that if you had 2 drives attached, BRU PE has a nice feature called “Doubler Mode”. This allows you to backup the same data to two different tapes, without having to run the same archive process twice. If you’re in the habit of making one copy for on-site storage, and one for off-site storage, this could be a big time saver. We only have a single drive, so we were not able to test this feature ourselves. There’s no point of going through all this work if you can’t find what you need later. We have a pretty simple library system that was easy to put into place. While BRU PE does have its own internal library system (covered later), we find our solution to be better for our workflow. Once we have a 1-1 duplicate of a archive folder to LTO tape, and we have verified that the contents of both are the same (using the verify function as part of the BRU PE software), we scan and catalog the folder that was the source for that particular tape. By doing so, we have a complete listing of what is on the tape that we can search anytime from any computer in the office, while the tapes are sitting on the shelf. The program we use to do this is called “CD Finder” from West-Forest-Systems. Don’t let the name throw you. 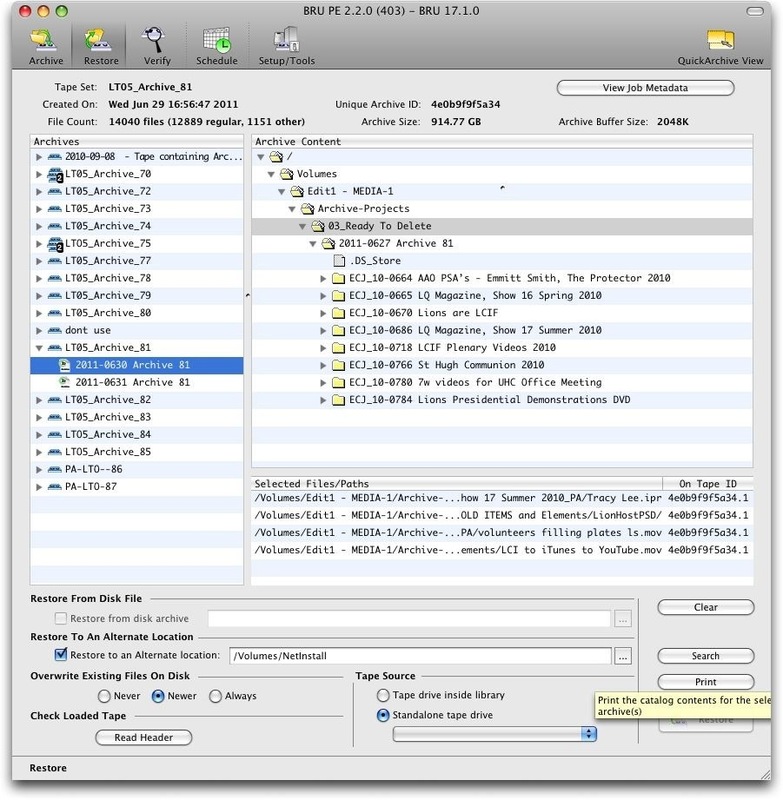 CDFinder is a cataloging/indexing program that works with everything from removable media to full hard drives. I’m actually surprised that they have not rebranded the program yet given how dated the software sounds just based on the name itself. I would guess they even miss out on sales because people see the “CD” and think “I don’t even use CD’s”. But unlike many programs I’ve tried in the past, CDFinder does the job perfectly, is a light-weight program that launches fast and indexes almost as fast, and finding that needle in the haystack is as simple is typing in a search term and hitting return. I also appreciate that the programmer (Norbert M. Doerner) keeps the program up to date and is always adding new useful features. Only a few weeks after Lion was released they released a Lion version of their program. When a big OS update like Lion comes out, you really find out which developers are dedicated to their programs and which are not. 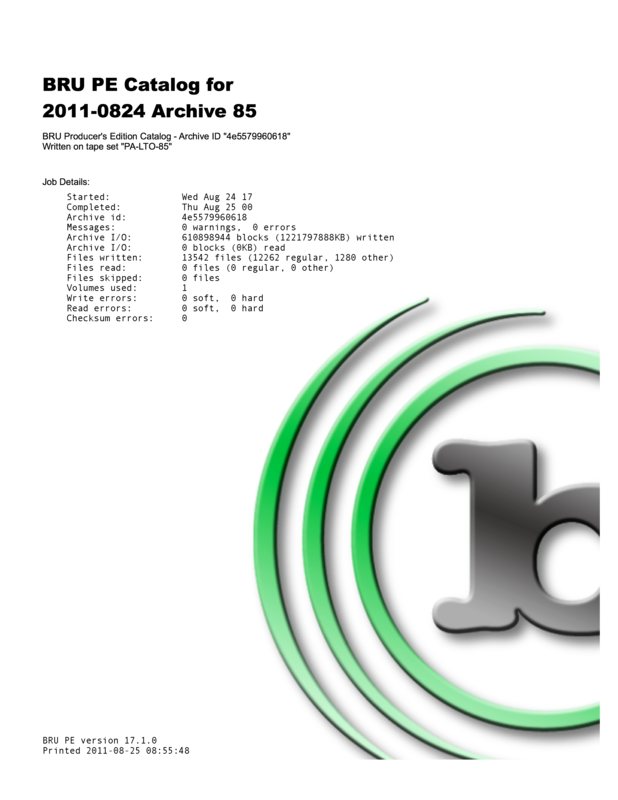 I’m not going to do a full review of the CDFinder program, you can do that yourself or watch some of their video tutorials on-line. What I will do is give you the basics of how we use it. 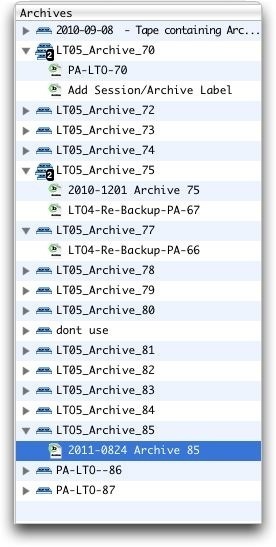 Because over time we’ve had different series of archives (hard drives, then LTO, and some client specific) we created a few folders inside of CDFinder to organize our catalog files. Inside of each of those folders is a list of the different media that was cataloged, and what is on each of them. 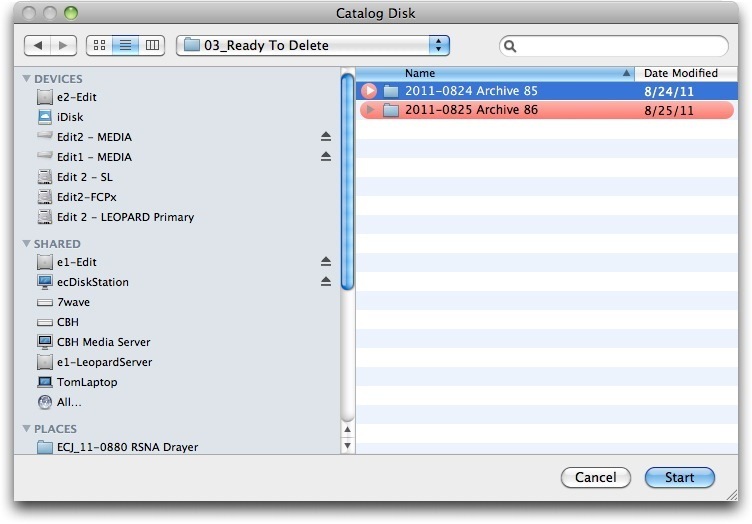 Creating new catalog is as easy is clicking on the “new” button, and selecting the folder, removable media or hard drive you want a catalog of, and hitting OK. The drive is scanned and a new catalog file is added to the library. If you really want to get crazy, you can even have CDFinder create thumbnails of images as part of the catalog so when you’re browsing later you can get a sense of the images you’re looking at. 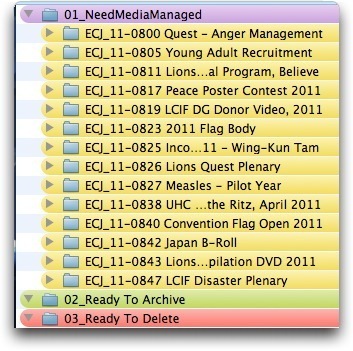 Here’s a look at just some of the cataloging options you’re given in CDFinder. Finding what you want is just as easy. Open the find window, choose the criteria you would like to search by, and hit find. A list of results will appear, and clicking on any of those results in the window with all the info that you need to reload that file or directory. If I have one gripe about the CDFinder program, it’s that they require that you purchase a “business license” to store the catalog file on a network share. It’s like Microsoft saying you can’t save a word document on your NAS drive because you didn’t buy a business license. I think where I choose to save my file is up to me, and I should’t have to pay extra to add back in a feature that every other program on the planet already includes. You may be wondering why this matters. It matters because if you want to use multiple computers to access the data that you’ve cataloged, you need to put the catalog file in a central location, and then point them all to it. But on the “Private” license (for $39) you are required to save the catalog file locally on the computer the software is installed on. That’s fine if you have one computer, but we can’t get by with just that. So instead, you have to pay $149 for the 2-user business license. That’s right, for more than $100 extra, you get the privilege to save your file on the network, and share it with ONE other user. There are no other additional features in the business licensed program. This is just bad business in my opinion, and does not reflect well on the company. My gripe aside, I like the program, think that it’s well written and it’s very actively maintained. I’ll step down from my soap box now. Now that everything is on the LTO tapes, cataloged and we’re confident that there are no errors, it’s time to move the projects to the 3rd and final finder folder, “Ready To Delete”. This is one of the most important steps in our workflow, and I prefer to save this final step for myself and only myself. The reason being, when it comes to deleting projects from the edit systems – I want to be sure if a mistake is made, it’s on me. I can handle being pissed at myself and I can’t be fired. It also serves as a nice check/balance. I’m able to verify that all of the proper steps were followed before this undoable step. This is where having such a unique job numbering system comes in extremely handy, and helps keep you from deleting files that you may not want to delete. The goal at this stage is not only to remove the project files that we just backed up to the LTO tape, but to remove ALL files associated with this project, and only this project. That includes the capture scratch and all audio and video render files. And they need to be removed from both RAID drives, since it’s not unusual for projects to be edited in multiple rooms. The way we handle this is with a program called Path Finder. 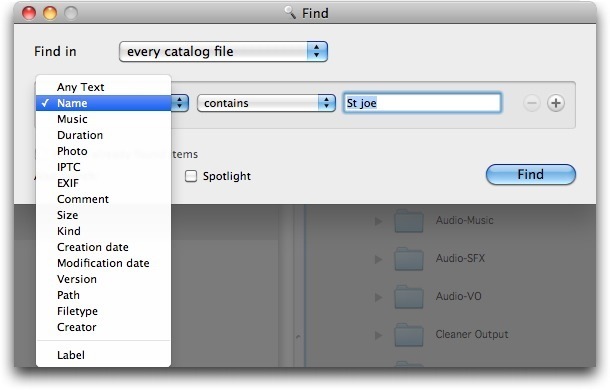 It’s a very full featured Finder replacement, but I only use it for this one purpose – its ability to search multiple local and remote locations at the same time and return all files in a single window. 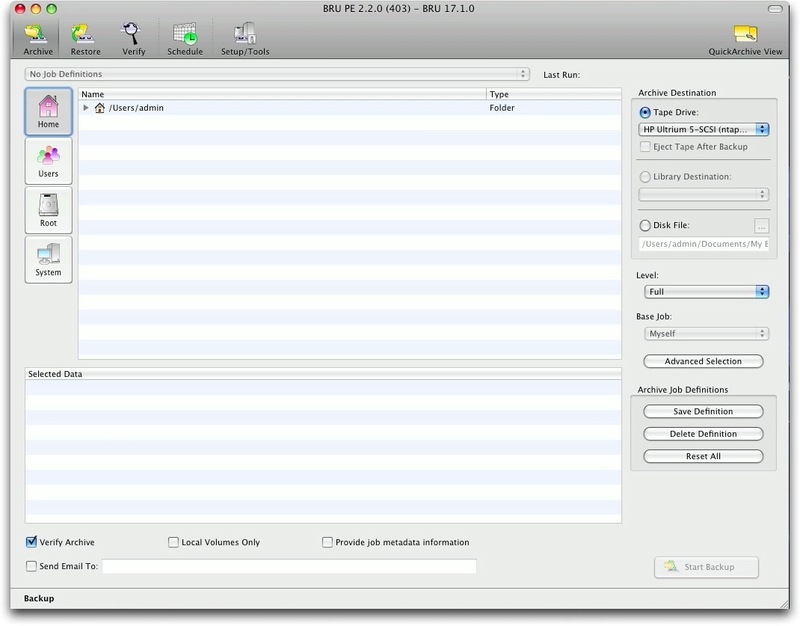 Path Finder allows you to search your entire computer or specific folders just like the Finder, but unlike version 10.5 or later of the Finder (including Lion) you can not set multiple custom locations. In our case, we limit the search to just the two RAID drives. By doing this, any search that we do on the job number will find every file and folder associated with that job, and nothing more. And instead of relying on the index file of Spotlight, we have it do a raw search of the drive, ignoring any spotlight information. When searching on remote drives, Spotlight can be hit or miss in our experience and tends to be slower. Now that we have our search locations setup properly, we’re ready to search and destroy (delete) our projects and all associated media. With the find window open, fill in the full job number. Actually, just to make sure to avoid any errors, I keep two windows open. One with the “Ready to Delete” folder and the other is the find window and results. With both open, I can copy and paste the job number into the name field. I also make sure “Starts With” is selected, because anything I need to delete should start with the job number. This prevents any other documents that might reference this number from being removed. Click search and almost instantly the lower part of the search window is populated with all of the files and locations that you need to remove. As a habit, I always review the find results and make sure nothing looks unusual. Again, I’m just making sure everything in the window is in fact part of the job that I’m getting ready to remove. Once satisfied, I do a “select all” inside the results portion of the find window and hit Command-Delete to remove all of the files. Local files are moved to the trash can, but remote volume files are deleted immediately – so be careful. So with one stroke of the keyboard, all of your files, from all locations local or otherwise, are removed. Now I just move down the list of jobs in the “ready to delete” folder and repeat the same steps for each of the job numbers. After that, empty the trash on the local computer and do the happy dance. You’re done and have new free space on your drives. 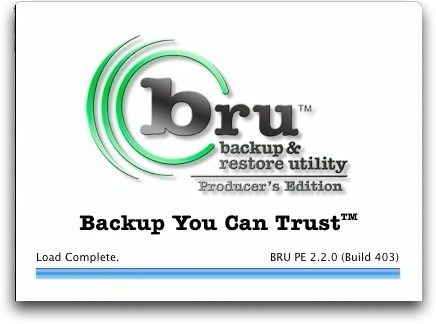 While backing up data is very solid using BRU PE, restoring is a bit less intuitive. It’s fine, and it gets the job done, it’s just not quite as smooth. When you click on the Restore icon in the toolbar, you’re presented with a list of catalog files for each tape that you’ve ever backed up on that particular machine. If there was more than one backup session to on a tape, there will be a number added to the icon as some of the ones here have. 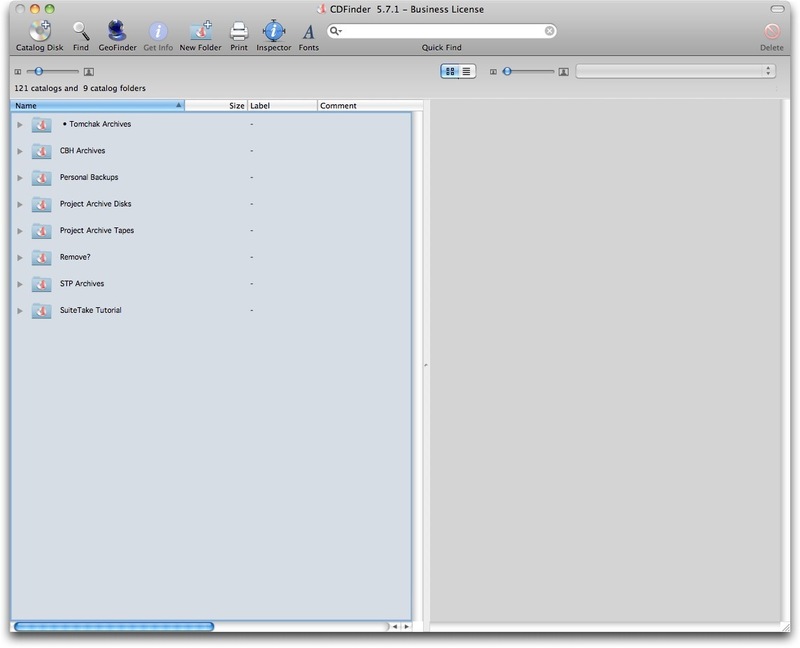 If you select a catalog file, the contents of that will be shown on the right pane. However, this is again one of those minor annoyances. By default it will just show you the root level, and then you will need to click on each and every disclosure triangle just to get to the folder with the data you backed up. And sometimes clicking on the disclosure triangle seems to be sluggish. You may find yourself clicking more than once to get it to open. But OK fine, it does work eventually. But when you’re ready to find those files, what you’ll really be doing is a search of the catalog. You can click on a single catalog (if you know what tape the file is on), or you can search the entire library all at once. In this example, I’m choosing to search for just a single job, and I know what the job number is. But what I find amazing in this day and age of things being infinitely searchable, is that you can only search on a single criteria. Normally if I was doing a search like this, I would choose to search using the job number, but then also add another criteria stating that I only want results returned that are folders with that name (because ultimately what I’m looking for is the project folder with that number). 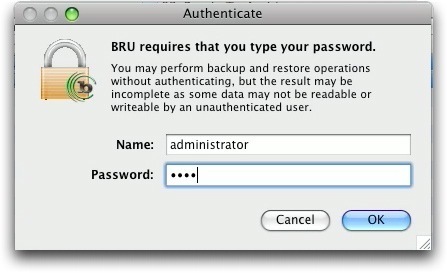 This is a big miss with the BRU PE software. 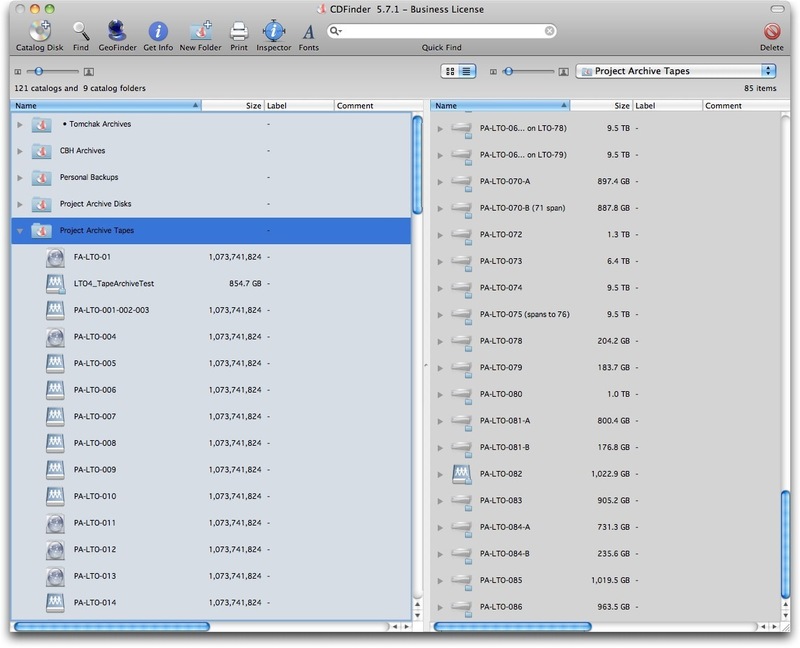 When we use CD-Finder to search for files we need to restore, it can search every archive we’ve ever created (totaling over 100 when you count the HD archives we made in the past and client specific backups) and it can do it in a matter of seconds. Most searches, even complex ones only take about 2-5 seconds. But just performing the simple search I’m showing you here on less than 20 archives took over 3 minutes. And because I couldn’t confine the results to only folders, the results I was returned still left me too much to have to sift through. This just makes another case for using CDFinder to keep catalogs of all of your archives. Our process is to do a search inside of CD-Finder, find out what tape it’s on, and then just go directly to that tape in BRU PE, find the files or directory and restore them. 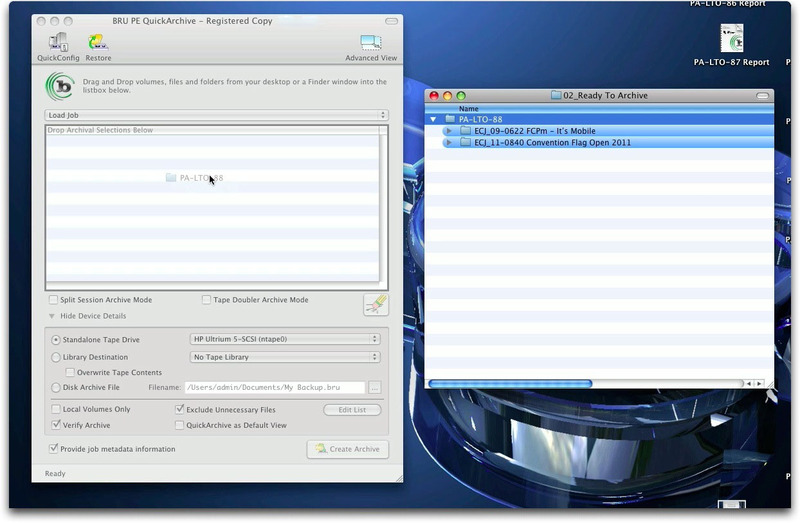 The whole process is so much faster, not to mention you can do many complex searches with CD-Finder in the time it takes to do just one with BRU. This is what the search window and restore results (for the same job) look like using CD-Finder. And this is the results that were returned. Infinitely more usable and user friendly. But let’s continue down the line of just using the BRU software and how you would restore your files. Once you have your search results and you’ve parsed out what it is you actually want to restore, you click the check boxes by the files or directories that you want, or you can choose to check all of them using the “add all” check box. You then click on the “Add Checked” button and close the window. You will now be returned to the main window with your selected items added to the window. The last option to decide on before you start the restore is where these files are going. 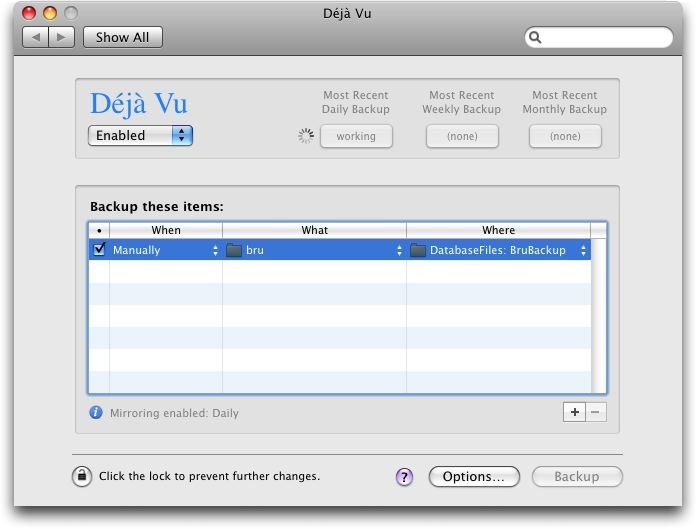 By default files are restored to their original location from where they were backed up. I guess this can be a good thing for some workflows, but for us this would just cause issues. It means that files would be returned to the “ready to delete” folder, which could cause some confusion. To avoid this problem, check the box that allows you to “Restore to an Alternate location”, and then navigate to any local or network mounted volume. 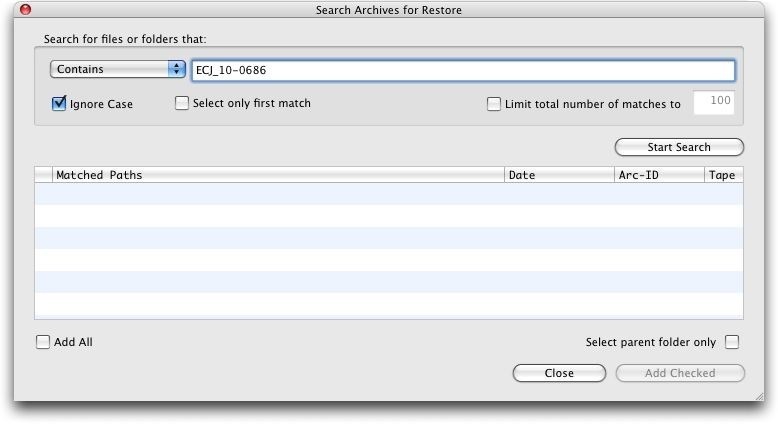 Now with everything ready to go, insert the tape you are pulling the files off of and click on the restore button. If you have the wrong tape in or the drive is empty, you will be prompted for the correct tape to insert. When you consider how much data a LTO-5 tape can hold, it’s pretty amazing how fast it can find the files it needs are restores them. Like I mentioned, everything we do is over gigabit ethernet and the speed is still lightning fast. Once your restore is complete a dialog box will appear letting you know that all was restored well. If what you’ve chosen to restore is on more than one tape, you will be prompted each time a new tape is needed. This is where a library system that can automatically load tapes comes in handy. 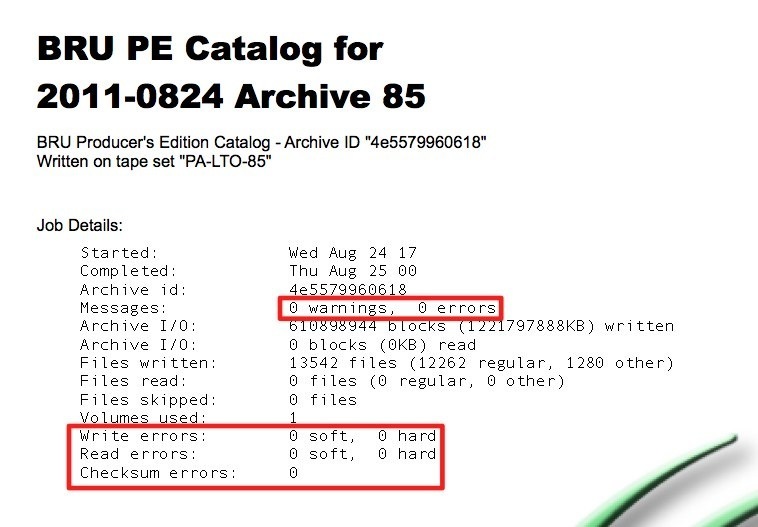 One problem we did run into during our test period is that at one point we launched the BRU PE program and the library of tapes that we had created (usually listed on the restore screen) were gone. While in practice we don’t use those files to locate files that we’re looking for (as previously mentioned, we use CDFinder and a external catalog file), the BRU PE software does need these files to understand what tapes have been created and what is on each tape. It’s what enables you to quickly restore your files from such a massive tape. With the help of tech support we were able to restore/rebuild the tapes that we needed by re-inserting each tape and having the catalog files rebuilt, but from that point on we decided that we should have a regular backup of that information. Even on the Tolis website they recommend that you do this. All of the important files that you need to backup are located at the following location. You may be looking at that “location” and be wondering how the heck you get to it. After all, to most people (other than developers) this is not a familiar location, not to mention it’s hidden from view in the finder. The best way to get to this location is to use the “Go to Folder” command in the finder. While in the finder, click on the drop down menu under “Go” and then select the “Go To Folder” option. In the next dial box that opens, type in the string outlined above and click GO. 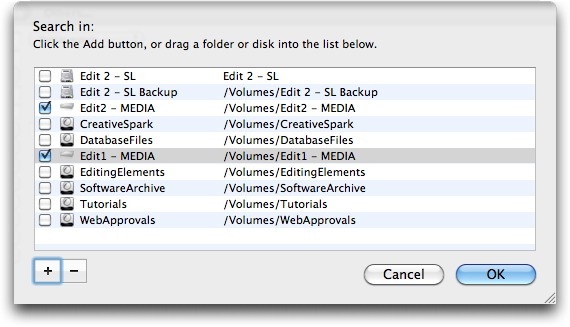 The next finder window that opens will be the folder that you need to keep a backup copy of. To make sure this always happens on it’s own, we use the program Déjà Vu that keeps this folder synced to our NAS on a daily basis. I would strongly recommend that you implement something alone the same lines to save you possible frustration later. 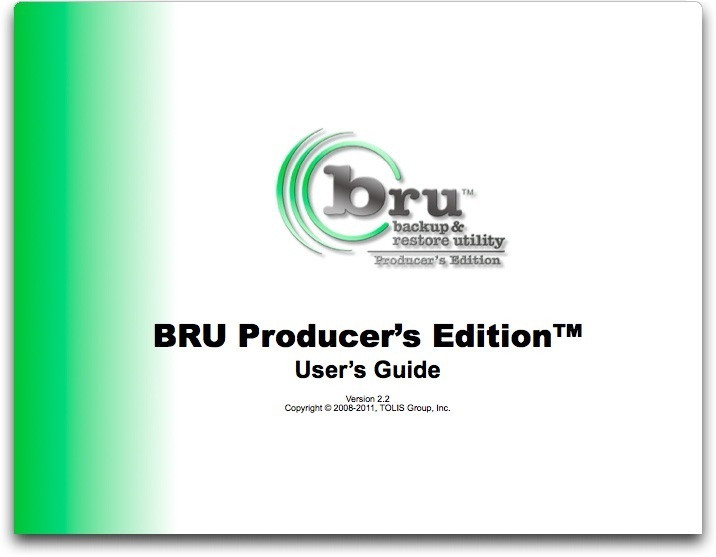 Being a bit of a manual geek, I can tell you that the BRU PE user manual is one of the better manuals I’ve read. It’s written in a way that’s easy to understand and gets right to the point. It covers every aspect of the software in much more detail than I’m doing here and even makes some recommendations on the topic of workflow. I also enjoyed the landscape format, which made it comfortable to read on my iPad. While the manual is 186 pages long, probably around a third of it is terminal commands. If you’re really feeling like the BRU PE GUI is just too easy to use, launch the Terminal app and try your hand at typing it all in by hand. Personally, I have zero interest in this, but there must be enough people out there to justify the detail they put into the manual in covering this topic. So now you have a solid backup of your projects, and maybe you even made a second copy to keep off site at home or in a safe deposit box. But what if the worst happens and the Tolis Group suddenly goes out of business or stops selling/supporting the product? After all, because they’re using their own proprietary archive format you actually do need BRU in order to recover your tape contents. Well not to fear. There are two very good pieces of insurance that will let you sleep better at night. First (as discussed earlier), every time that you create a new archive tape, at the end you are presented with a dialog that lets you create a CD or DVD that includes the catalog file for that tape (basically a list of it’s contents and location on the tape), all metadata, and a copy of the BRU PE Software that you just used to create the tape. They disk also includes installation and restore instructions. So aside from the hardware needed to do a restore, you have everything that you need between the LTO tape and the CD/DVD that you create. They call this disk a BRUsetta Stone CD. But if the worst happens and the Tollis group goes out of business, they are committed to put the most recent copy of the BRU software in Escrow with the NARAS, and if you’re a member of NARAS you can retrieve a copy if you need it. So it’s not as if you’re going to no longer have access to your data. Here is my personal take. The Tolis Group has been around since 1985 and has a great history of making great products. I see no reason to worry about them going out of business anytime soon, and even if they did I am left with the tools that I need (through the BRUsetta Stone CD) to restore any tapes I have made over the years. True, I would probably want to start looking for something new to create new archives, but I would not be locked out of my old archives. The fact is that technology changes so fast that my guess is 5-10 years from now I may not even be using LTO in favor of some newer and greater technology. When that comes along, I’ll move forward as well. And over time, the archives I’m making will have less and less value anyway. While the tapes are rated to last for 30 years, I would be happy if they lasted for half that. No client has ever come back to me for something older than 5-6 years, and that is very rare. My point is, I don’t need to keep these backups until the end of time. And if 30 years from now I had better not be still browsing my LTO-5 tapes and restoring jobs for clients. If I am, my life has taken a very bad turn somewhere along the line. While the focus of this review has been on backing up your edit projects, if you’re looking for something more comprehensive that will backup multiple computers in your office, BRU Server might be something worth looking at. It adds the ability to do client to server automated backups over your network so that entire machines are regularly backed up. The price point is obviously much higher and instead of a single tape drive you would usually use a library system that would hold 12-24 tapes. And if you REALLY have money to burn, go for their Backup Appliance called bruAPP. This is a standalone device that includes both the BRU Server technology and OS, combined with a tape library system. 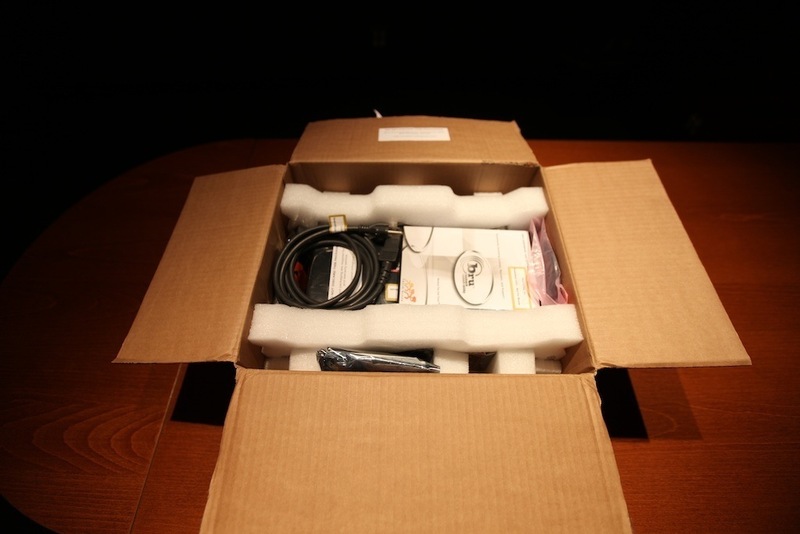 It’s everything in a single box, and can be configured to hold upwards of 144 TB of storage. It also includes internal disk storage that allows you to “stage” your files for backup so that your local network is not impacted during large backups. If I had the money I would LOVE to have this as part of my office backup strategy. I’ve talked a lot about the BRU format as well as TAR, and some may be wondering about the newer format called LTFS (Linear Tape File System), which has been brought to light by IBM to address some of the shortcomings of the TAR format. This format promises the use of LTO tapes directly on the desktop, allowing you to mount them to your desktop and use them more like you would use a mounted hard drive. One of the significant advantages of this format is that the catalog is included on the tape, so in theory if you have the proper software installed you could mount a tape on any machine just by popping it into the drive. On the surface this sounds pretty awesome. We all know how to interact with hard drives and to see a tape mounted on the desktop that you can just drag and drop files to/from sounds like the holy grail. That is, until you get into the details of it. I’ve looked into it and talked to a few engineers about their opinions and here’s the short answer of what you need to know. The LTFS file system has issues with slow access to files, no knowledge of an unmounted tape, single user access and limited file type compatibility. In addition, cross platform file exchanges are problematic because different software and drivers need to be written specifically for each platform, and may not be able to read tapes or files created on other systems. In short, in the current incarnation of the format it falls short of being a solid backup format and almost borders on being expermintal. While it’s possible that down the road this will change that remains to be seen. And after all, we’re talking about what is possible right now, not in the future. So while I was initially very excited about what the LTFS file format might provide, as usual the sales pitch is better than the actual facts behind it. At the time of this writing the BRU folks have no plans of supporting the format as it now stands, and I think that’s a good thing. Just adopting a new format because it’s the latest and “greatest” thing is not always the best thing. I think it says a lot about their engineering team that they have investigated it and decided it was not up to par for their products. If you would like to read more about the format yourself, you can find a pretty detailed entry on Wikipedia here. While the software can be purchased as a standalone product for $499, in most cases you’re going to want to buy the hardware bundle unless you already own a tape drive that you want to use. As part of the whole package, the software is cheaper with the bundled price. With all of their bundles you get a license for the BRU PE software and 1 year of support. Support includes help using the software, but also includes any upgrades to the software beyond bug fixes that are released during your 1 year period. If you let the 1 year support contract lapse, you can still use the software but will not be eligible for upgrades to the software. I’m not sure that’s a big deal, because generally speaking if it’s working, it’s working. It does everything I need it to, so I’m not sure what features might be added that had me wanting to upgrade. If you do decide to continue your support contract, it will cost you $199 per year and you would get all major updates (say version 2 to version 3) included in that price. If you don’t have it, and the same software is released you can still purchase the software for $249. One of the big misses that many editors make in my opinion is passing on their ability to turn this process into a service that they sell to their clients. The big complaint that I hear is that buying software and hardware like this can be expensive, and it really can. But not prohibitively so. The fact is, people do need archives of their projects and in many cases they are willing to pay you to take care of it for them, and to keep track of everything. On top of backing up editing projects, another big room for growth has been backup camera originals from tapeless media, which is all we shoot anymore. I can only speak from our own experience and tell that in far less than a year we were turning a profit on doing backups over what we had paid on both the hardware/software and the tapes we purchased to do the backups. We charge a flat fee per project, and in most cases can fit more than a single project on a tape. So a single 1.5 TB LTO-5 tape can generate anywhere between $500 and $1,500 in revenue depending on the size of the projects. It’s pretty easy to do the math and see how this is not much of a risk in the long run. The fact is, you are offering a very valuable and necessary service. Here’s how we approached it. I ask every client this question. “As part of doing this project, would you like me to back it up to a long term storage tape for future access, or do you want me to just delete everything when I’m done?” What would you say to that question? While we charge a flat fee for creating an archive of each project, we don’t charge anything for restoring files. So the client can recall those files as much as needed and know that they will not be billed for it. It’s seriously something to consider when you’re looking at creating your archiving system, your workflow and a library system. While it might be a lot to get pulled together in the beginning, it’s well worth it in the long run on many fronts. While not without a few minor annoyances, I’m very pleased with the BRU software and hardware bundle. For the first time in a very long time I feel like I have a very solid and robust workflow and backup system. That’s a big deal, because if you don’t have something you have faith in, it can add a lot of stress to your life (at least it has for me in the past). We have now used this solution for over a year and feel very comfortable saying it’s a nice solid and affordable package, even for a small boutique post house like Edit Creations. I look forward to your comments and your own shared experiences. Thanks, this is really, really helpful. 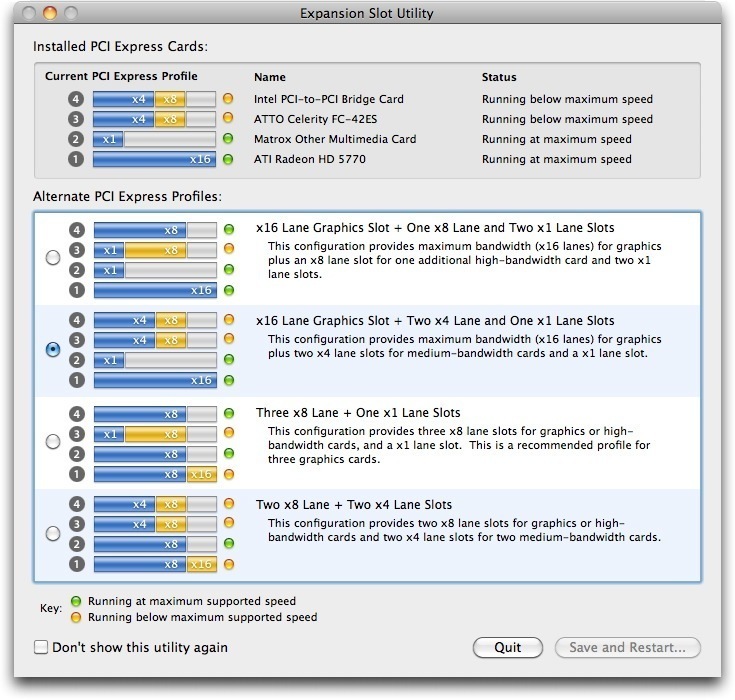 I’ve about reached the limit of my MacPro with all HD bays full and need a long term solution. Hard drives on the shelf are cheap but unreliable. The HP drive is a very solid drive and I’m not sure I would go for the cheapest drive here. In my experience they’re all pretty close in price when you’re looking at name brands. As it says many times throughout the review, we use LTO-5 for all of our testing.